Get ’em while you can! It has been pretty good catchin’ these past few weeks with the new Silver Horde “Two Faced” Spoons getting very good results. We have been focusing on the “green” color patterns and hitting the larger fish down deep in the 140 to 160 range. Area 9 officially closed last Saturday. 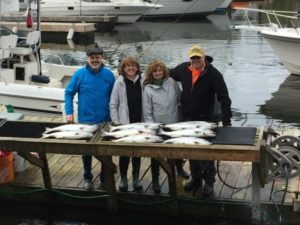 Fishing report: The salmon fishing has picked up this last week with immature chinook weighing up to 10 pounds but most running in the 5 to 7lb. range the best areas continue to be the slag area to Owens beach and mostly trolling in 120′ to 150′ of water about 10′ off of bottom, flasher and spoons or artificial squid seem to be the best producers. A few nice fish of Point Evans jigging in the bait. If you prefer to mooch or jig there are salmon being caught at Pt. Dalco on the flood and Clay bank area on the ebb. Plan ahead for the ABC Boater’s Education Class on Wednesday Nights from 7-9 pm May 3-31, 2017. This class will provide the requirements for the mandatory WA State Boater’s Card for boats with 15 hp or greater. The class will provide a Boater’s Manual and Navigational Software. Cost is $50. The class is taught by Tacoma Power Squadron. Info call 253-591-5325. ABC Boater’s Class II for beginning boaters on Monday and Thursday nights from 7-9 pm , June 5-19 (5 nights total) This class will provide the requirements for the mandatory WA State Boater’s Card for boats with 15 hp or greater. The class will provide a Boater’s Manual and Navigational Software. Cost is $50. The class is taught by Tacoma Power Squadron. Info call 253-591-5325. Point Defiance Marina Swap Meet. Come Shop or Sell/Trade on Saturday, May 20, 2017 from 10 am to 3 pm. Cost is $15 for a 10X 10 covered space. More information call (253) 591-5325. This weekend there was a carp shooting tournament. The lake had several boats on it with raised platforms to see their targets. The carp use the same place that spawning bass use and in doing so they destroy the eggs recently laid. This event really does help the bass fishermen. On Moses Lake there was a big bass event both Saturday and Sunday. There was a $350 prize for the heaviest bass weighed before the hour so there were many winners. In one case I saw a team win three hours. I talked to the winner of hour one on Sunday and the over winner of $5300 and a nice trophy. The finals of this event will be on Moses Lake after at least 2 more events. The team that won the big fish on Sunday and the overall caught their winning fish of 8.1-pounds on their first cast. Check out this series on Big bass tournament sponsored by Limit Out Marine located in Pacific Washington. Also a big donor is Angler Inn International in Mexico with trip donations. Water is warming up and the bass are moving into the shallows. Just where are the Walleye is the question. In a couple of weeks there will be a Walleye tournament her at Potholes. We are often hesitant to say the fishing is “that good” or the best “Early Spring Salmon Fishing in Years”, but this last week has been just that….. OUTSTANDING!! We are not sure how long it will last, but it sure bodes well for the next couple months! The best fishing has been over on the far side of Georgia Strait from Neck Point down to the South End of Galiano Island. The fish are out in the deep water in 200 to 1200 gorging on herring. Most days we are hooking 15 to 25 salmon and coming back with limits of chinook averaging in the 8 to 15 pound range. The Vancouver side has been good as well, but not nearly is a good as the far side of the Strait. Locally we have had some good success in the deep water off the Bell Buoy, the Hump, Cowan Point, Roger Curtis and off the QA marker. These fish are actively feeding and we have not really been running much bait. Spoons and hootchies have been working well! Gibbs Delta G Force G Force and Skinny G’s and Silver Horde Kingfisher Spoons in green/white/chartreuse combos have been excellent. Yamashita glow/green/chartreuse hootchies have been working great as well. On the Gulf Island side we have been running our gear from 100 to 170 feet down. On the Vancouver side, we have been running shallower and getting our bites a little shallower 80 to 130 feet down. Stop by our charter/tackle shop on Granville Island for all the latest reports and the right tackle and bait for local waters. If you are looking at getting out on the water, full day charters are needed to fish the Gulf Islands! If the weather is too rough to cross, there is good opportunity on the Vancouver side of the Strait as well. 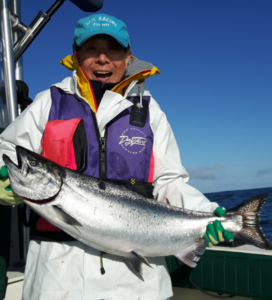 We are not sure how long this “best in years” spring fishing will last in the Gulf Islands, but things are sure looking good for this spring! For more info call Jeff or Jason at Bon Chovy Fishing Charters (604) 763-5460,bonchovy.com email: info@bonchovy.com. The cover image of this week’s fishing reports, showing Chad and Claudia with a dandy halibut caught in late March, was also contributed by Bon Chovy. Salmon fishing was GOOD this past week. The best fishing has been near Beechey Head and Aldridge Point. There were hatchery springs up to 21 lbs caught as well as the more common smaller 6-12 lb hatchery springs. The best depths for trolling has been 100 – 110 feet on the downrigger. Some large wild springs were caught and released inside the bay near Lamb Island. More anglers are using bait now and are finding anchovies in glow teaser heads have been working best. Spoons, especially G-Force and Skinny G spoons, in No Bananas or Outfitters’ colours have been very effective. For flashers, the Red Glow Hot Spot, Lemon Lime and Green/Glow Hot Spot. Salmon fishing was GOOD recently. There are hatchery springs into the teens near Brodie Rock and on the Flats. The salmon are feeding on needlefish and have been at depths from 65 to 145 feet, depending on where the feed are located. All of the anglers have been either bottom bouncing or jigging close to the bottom. Good trolling lures have been Coho Killers, Bon Chovi or Outfitters Skinny G spoons or AP Tackleworks needlefish spoons. Sandlance lures and squirts (needle fish) are best in pearl, white & green, or white glow. Good jigging lures have been Point Wilson Darts and the Delta Mac Fish. 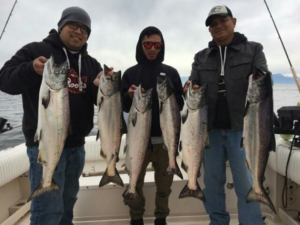 Pedder Bay Marina reports GOOD salmon fishing for hatchery springs from 6 to 12 lbs in size. The fishing was best by the Can Buoy at the mouth of the bay and in Whirl Bay. There are lots of needlefish in the area and salmon are targeting them. Most anglers are using artificial lures and trolling close to the bottom, but anchovies are also producing well. The fish haven’t been too picky about what they will strike. Spoons, especially G-Force, Skinny G and AP Tackle works spoons in Outfitters’, Bon Chovy or No Bananas colours, have been very effective. Hootchies and squirts with a green and glow color combination have been good plastic baits to use. Anchovies were still working this past week. Good choices for teaser head colors are UV Green, Chartreuse, Bloody Nose and Purple Haze. Flashers that are popular include the Hot Spot Red/Glow, Lemon-Lime and Madi. Salmon fishing was GOOD this past week. Salmon up to 19 lbs have been caught in and most areas around Sidney have produced keeper springs. Right now, Sidney is probably the best area to fish if you are looking for a large salmon, especially with no size restrictions in place here. Good areas were Hamley, Coal Island, Saanichton Spit, Fairfax and Pender Island. There are still a lot of undersize fish around too providing frequent action. 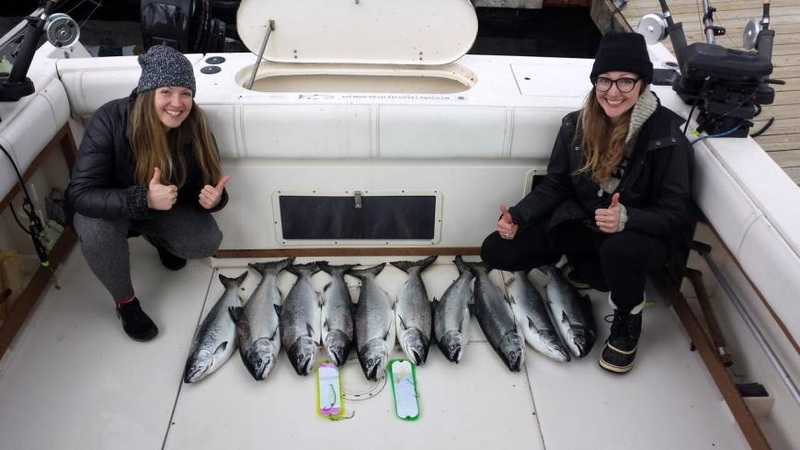 Anglers using spoons found silver Coho Killers, Gibbs Needle G and AP Tackleworks needlefish spoons the most successful spoons this past weekend. Anchovies and Tiny Strip were also good producers of fish. Tickets are still available for the 7th annual Sidney Anglers’ Salmon Derby. The salmon fishing has been GOOD for springs. Most of the hatchery fish are running from 6 to 10 lbs in size. There have been a few larger unclipped fish that have been caught and released. The best fishing remains in 110 to 130 feet of water with the salmon close to the bottom looking for needlefish. Good areas have been near Otter Point, the Bluffs, and Tugwell Creek. Most of the anglers are using artificial lures and the Skinny G needlefish spoon in the Outfitters color scheme has been the most effective spoon. The top spoons for Sooke anglers have lots of glow, red or Moon Jelly as the primary color. Good choices for teaser head colors are UV Green, Chartreuse, Bloody Nose and Purple Haze. For flashers, you can’t go wrong with a Super Betsey, Madi or Bon Chovi Flasher. Hootchies in White, Glow/Green and Purple Haze have been effective recently. Halibut fishing has been slower west of Sooke. Our regulations are the same as the previous year with your allowable limit to take home being: 4 Chinook, 4 other Salmon (Coho or Pinks), 6 Ling Cod, 6 Rock Fish and 2 Halibut. With over 90% of our guests going home with limits of Salmon, Halibut and a mix of others, this makes for a freezer full of beautiful vacuum packed fillets for the coming winter. Remember all your vacuum packing is included in your trip with us. Many of the other lodges charge you for this service on top of your package rate. This can amount to hundreds more! Fishing was PICKING UP in most lakes for trout and bass as water temperatures are rising. Winter run steelhead fishing is over in most rivers on both sides of the Island.